Hi I'm your host Raichu! In my gym we've got reviews and some other really cool stuff. You can also e-mail me if you want. (Although I don't think Raichu's can type very well. Hey! I'm having trouble already) Feel free to browse around my site for a while. On my page, I'll show you all the wonder's of pokemon. 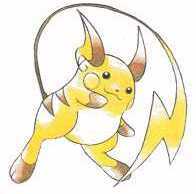 (Note: Raichu is da best pokemon!) Yup, and there are movies about pokemon. (Too bad they don't have any movies about Raichu's) All you need to know about being a trainer and maybe I might put up some pictures of cards if I have the time. Please sign my guest book when you leave so I can keep track of the people visiting my site.